Police Minister Bheki Cele has reiterated that police are allowed to use deadly force when under attack. He has been addressing the commemoration of the five slain police officers in Ngcobo in the Eastern Cape. Three were shot at the police station and two on the outskirts of town on this day last year. “To protect, combat, investigate to ensure all South Africa inhabitants are safe, so says the bible of running the country, the Constitution, Criminal Procedure Act section 49 , police have a duty of protecting the innocent and themselves and when attacked they must use deadly force. The word there is deadly,” says Cele. 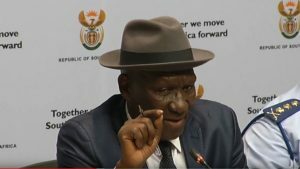 The post Police are allowed to use deadly force: Cele appeared first on SABC News – Breaking news, special reports, world, business, sport coverage of all South African current events. Africa's news leader..